What does the mule have in his pack? A new wargame mat. Over the weekend I went to the hobby center (the big kind with everything from models to fake flowers to cloth). 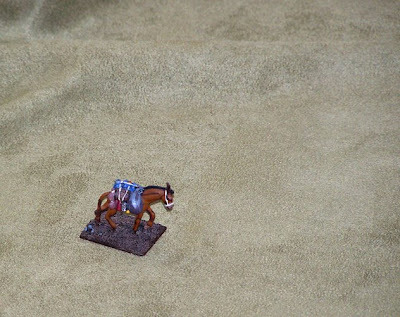 I had intended to buy the most inexpensive cloth to cover my table for wargames. Then I saw the fabric pictured above. It's similar to velvet in that it has a slight fuzzy texture—like grass! So, on an impulse I bought 3 yards of it. I immediately had buyers remorse. The material has a number of negative. a) At $8.50/yard it's relatively expensive. b) It's not a natural fiber, so it can look a bit shiny, especially in the folds. c) The synthetic fibers + the dry climate of Colorado = static shocks! I feel guilty at the price, but I am happy with the cloth. Maybe if I brush on a wash of paint it will cut down on the shine and the electric shocks! What other expensive goodies is that mule carrying? A new can of GamesWorkshop spray primer. I have been avoiding the stuff for years. Maybe 3 years ago I had one incident where the spray paint mixed with the humid atmosphere and created a gritty texture on my models. Since then I have been using brush-on primer, Humbrol's matt black enamel. I have been very happy with that, but I need to prime a terrain piece I just finished modeling. Yesterday I popped in my local hobby shop (the wargame kind), and grabbed a can of primer. $16.5o with tax! Has it been so long that I forgot the price, or has it gone up since I lost bought a can? These were rather pricey purchases for my small hobby budget, but maybe I should rationalize the expense. This summer I found a huge blue sheet of builder's insulation in a dumpster at a construction site. It's maybe 3 x 8 feet for free! This foam retails at $20 something, so if I average all three together the total cost doesn't look so bad!